Oh man oh man! 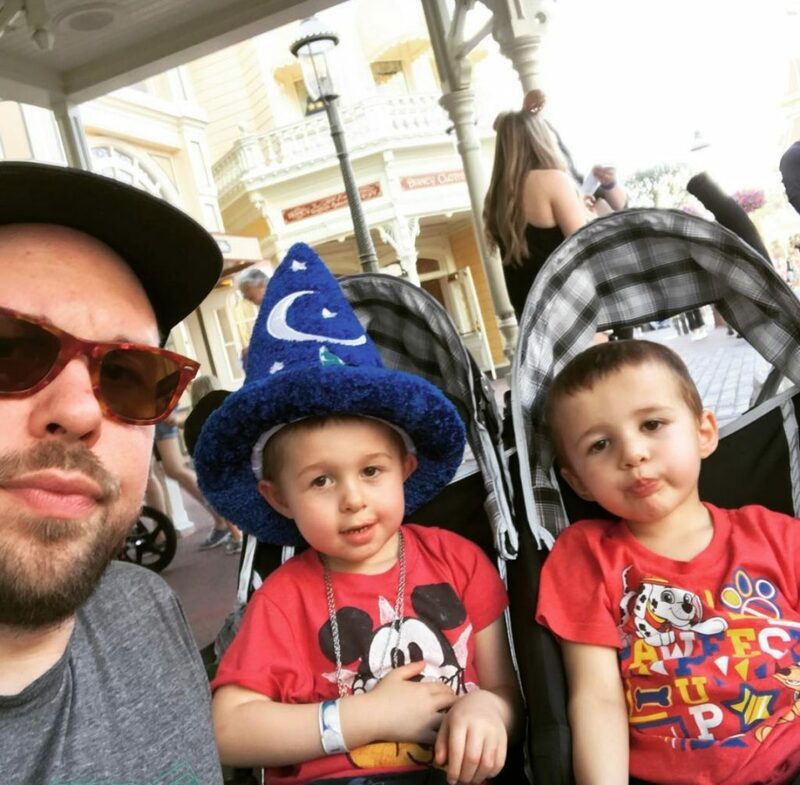 I have just returned from one of the most bonkers weeks of my life down at Disney World for our first big-time family vacation with the kids, hence the unconventional Wednesdays With Lazerbeak post. 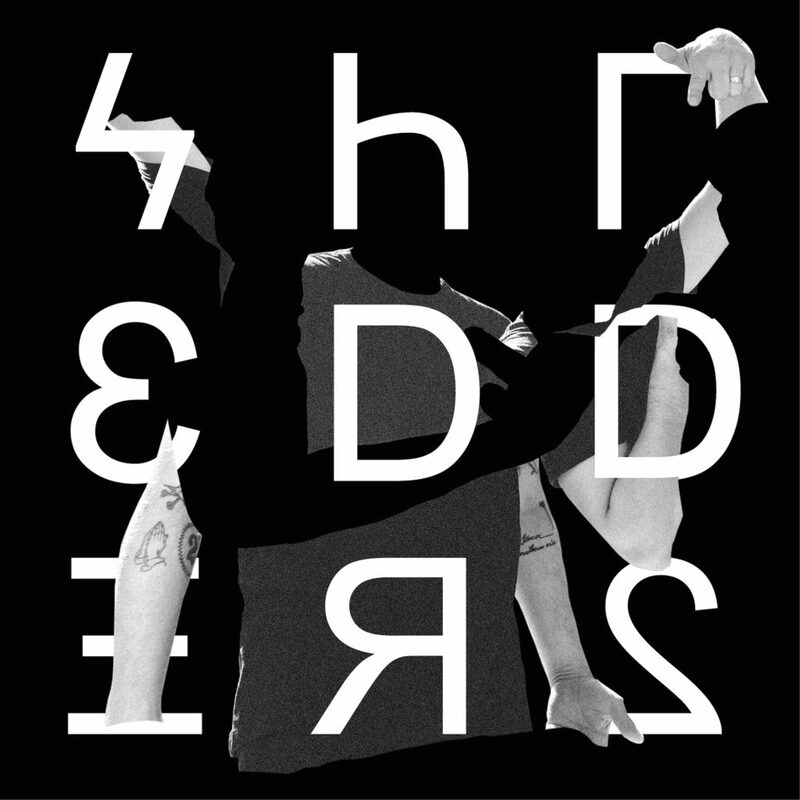 More on that at the bottom, but first things first, let’s jump right into this Shredders Remix Contest update! We received over TWO HUNDRED SUBMISSIONS for this thing!!! I cannot even begin to explain how truly wild and awesome that is. Far exceeded my expectations and I’m so happy to see that type of participation. I’ve got a huge smile right now as I’m typing this, and I can’t wait to listen to every single one of these over the coming days. You can do the same by checking out the two Soundcloud playlists below. The first one is for the producers and DJs who remixed the acapella vocal stems from Dangerous Jumps. See that below. And this second playlist is for the vocalists, rappers, and singers who created new songs over the Dangerous Jumps instrumentals. See those below. This is the week where we’re putting everything to a public vote. Listen through the submissions and vote for your favorite track in each playlist right HERE. Public voting will end on Monday (3/12) at 11:59pm CST. 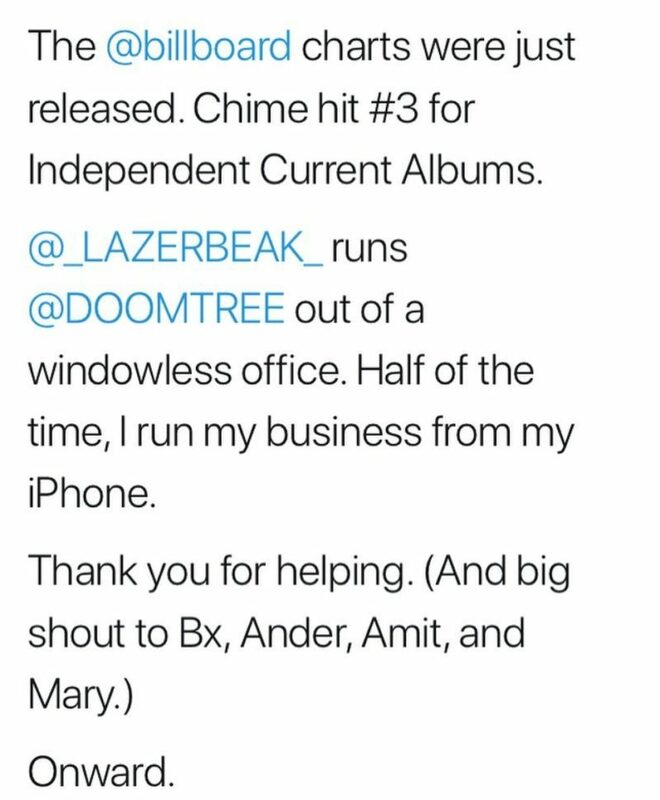 At that point we’ll tally up the top 5 winners in each category and present them on Tuesdays With Lazerbeak this coming Tuesday (3/13). All 10 winners will receive a major care package from the Doomtree Webstore and on Tuesday, March 20th we’ll reveal our top pick for best vocal remix and best production remix (decided by Stef, Sims, Papes, and myself). Should be a total blast these next few weeks, and more than any of the prizes, I’m most excited to see people sharing their music and art with one another and hopefully building connections, making friends, and collaborating with one another throughout this process. Oh, and if you’re not as into the whole contest thing or aren’t personally the musical type, you can always just vibe out to the newly released Dangerous Jumps instrumentals from Paper Tiger and myself right HERE and enjoy doing whatever it is you love the most. Speaking of Paper Tiger and myself (SEGUE!!!! ), our very first hometown production/DJ duo set together as Sick Trim was just announced last week. 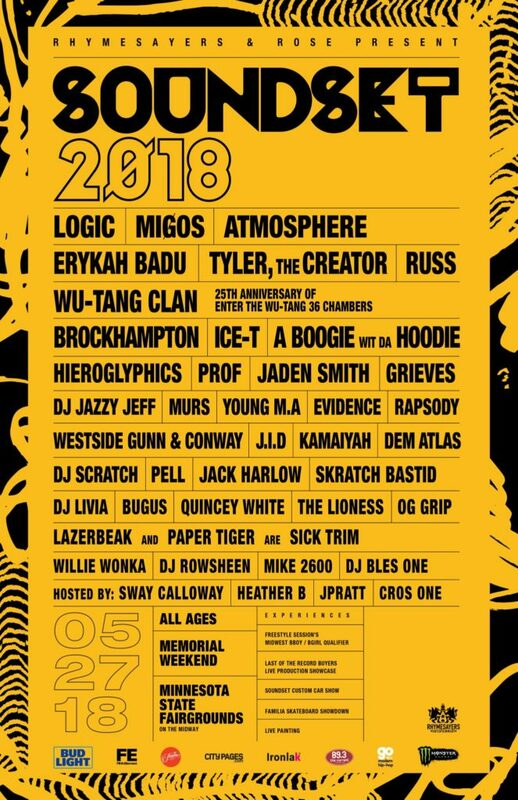 We’re going to be playing at the 11th-annual Soundset Festival on May 27th at the MN State Fair Grounds! Check out the incredibly stacked lineup below and grab your tickets right HERE. Can’t wait! 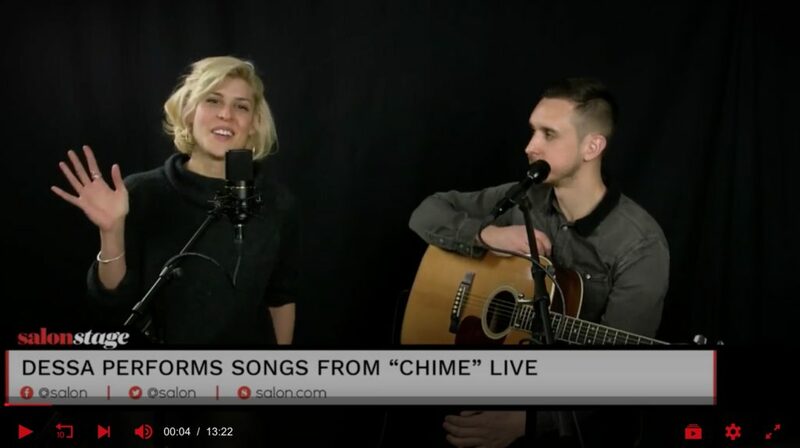 Dessa’s brand new album Chime has now been out for over an entire week and we could not be more excited about how things are rolling along. Dessa took to Twitter on Monday after the Billboard charts came out to drop this bomb. So true. We run this operation about as bare bones as you can get, and to have a release crack the Billboard Top 200 and #3 on the Independent Albums chart is no small feat. Our pre-order is a huge reason why we’re able to break into fields like this. Can’t thank each and every one of you enough who bought the album, shared the album, told a friend, RT’d a link, etc. Let’s keep this thing going. If you haven’t checked out Chime yet, or just want an easy landing page to spread throughout your circle, you can find everything right HERE. I wanted to share a few more cool press items that have come in since last week as well, starting with this great stripped-down performance at the Paste Studio in NYC. Huge shouts to NPR for showing this album so much attention. 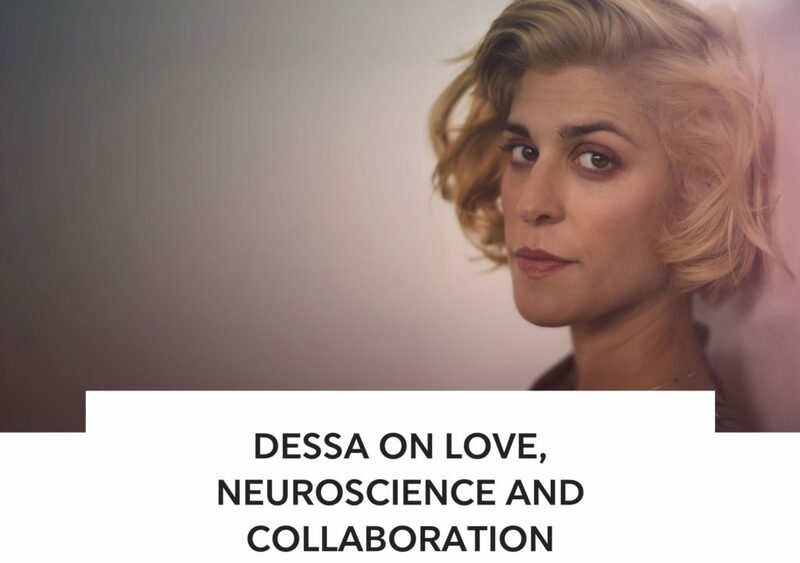 You can check out their latest interview with Dessa in the player below. The 405 also sat down with Dess for their Exchange podcast and got super into the making of the new album. Hear that on the player below. And check out this written interview from Tidal right HERE. One more stripped-down NYC session, this time with Salon. Watch Dessa and bandmate Matt Santos break it down by clicking the player below. 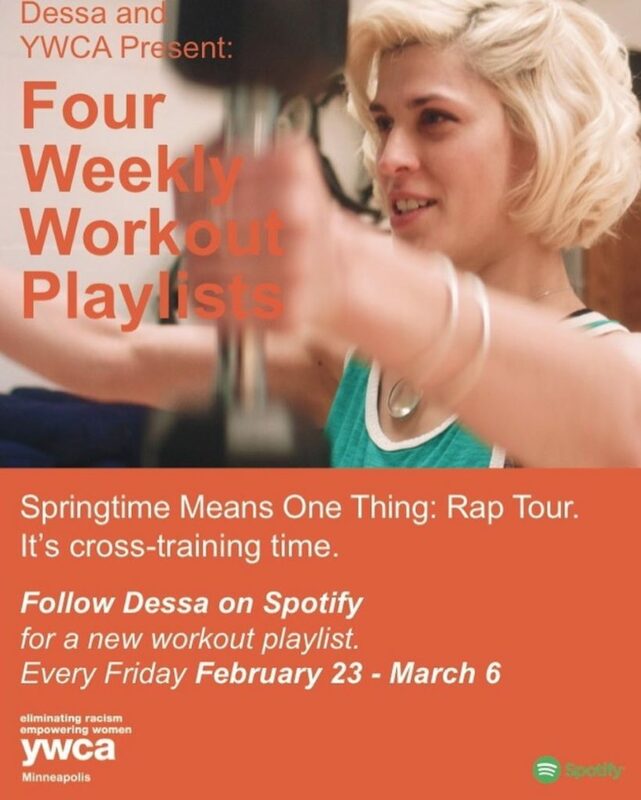 And lastly, Dessa has teamed up with the YWCA to curate four weekly workout playlists to get you amped up on your next visit to the gym. Check out the first two playlists below. 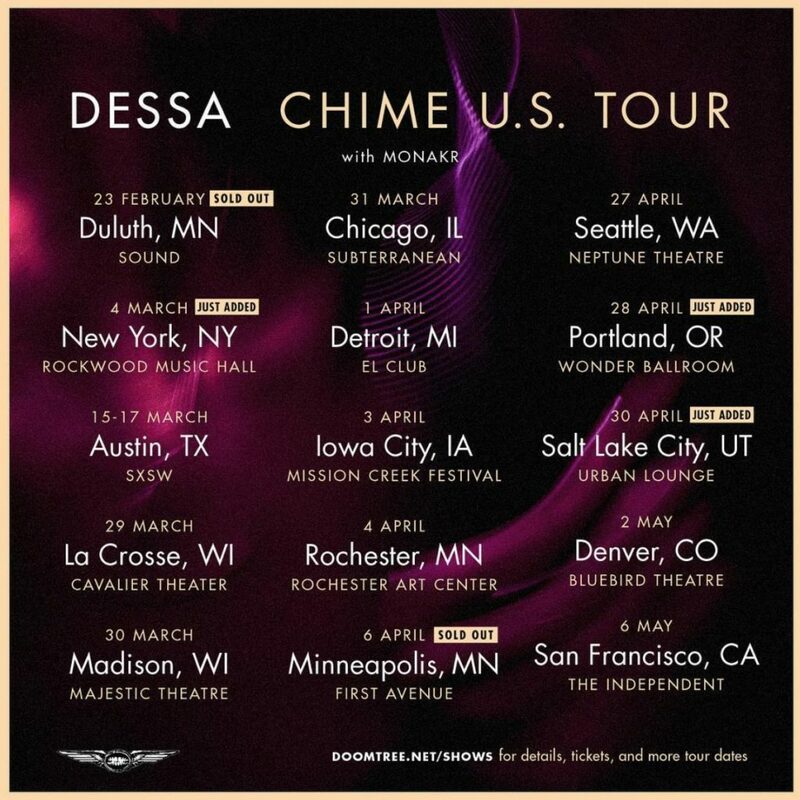 With all of this momentum building behind the album, Dessa will be hitting the road hard in 2018 and bringing Chime to a city near you. Here are the most recently announced US dates. A lot of these are already selling out, so make sure you grab those tickets right HERE before it’s too late. 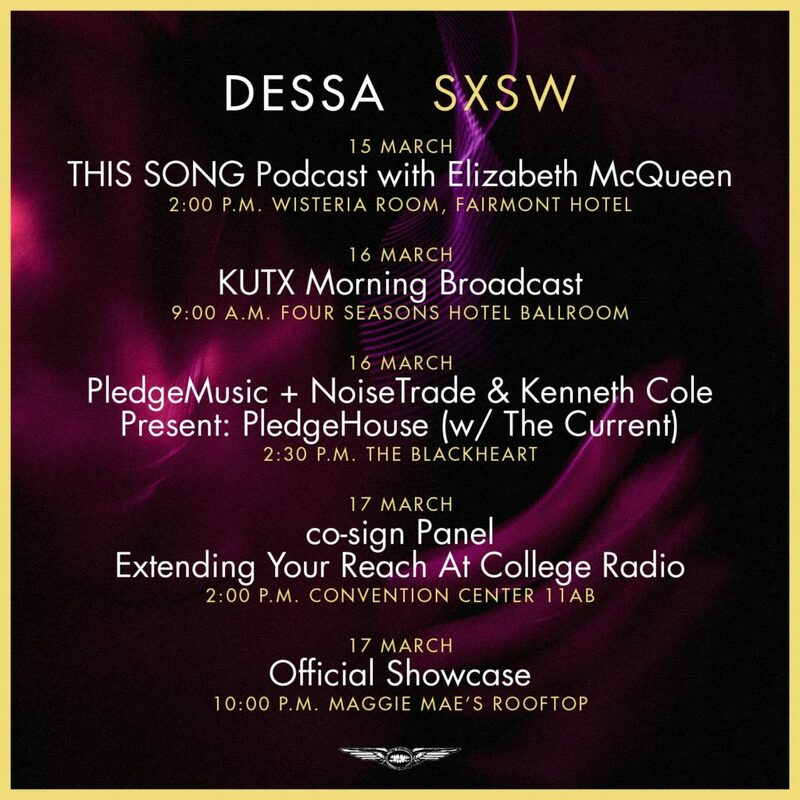 In between all of that, Dessa will be making a three-day stop down in Austin for this year’s SXSW convention/party/debacle. Check out all five performances below and grab more info right HERE. And speaking of March shows (Double Segue! 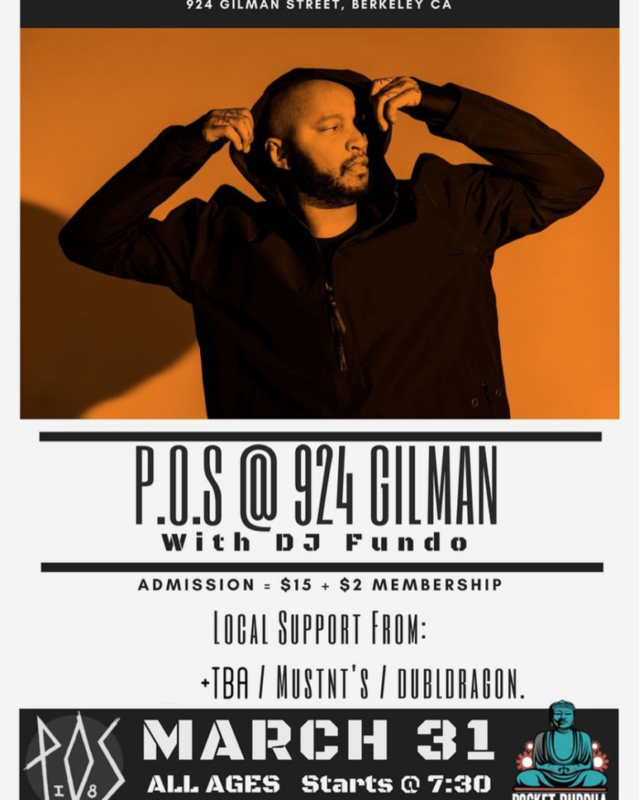 ), P.O.S will be playing a special one-off in Berkeley at the legendary underground venue 924 Gilman. Check out the details below and grab your tickets right HERE. 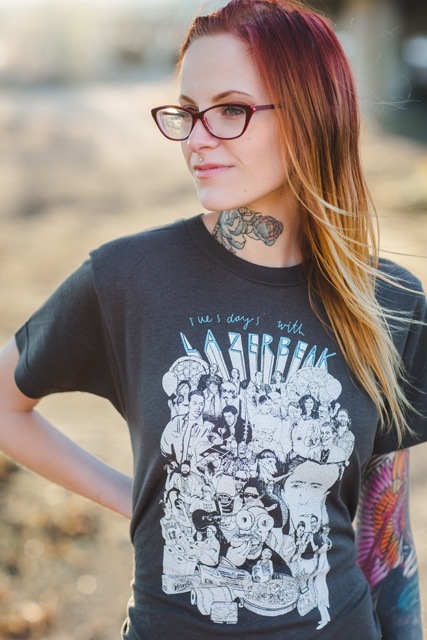 Alright, that does it for Doomtree-related news this week. Let’s dive into a ton of Bonus Jams that I’ve been bumping as of late. 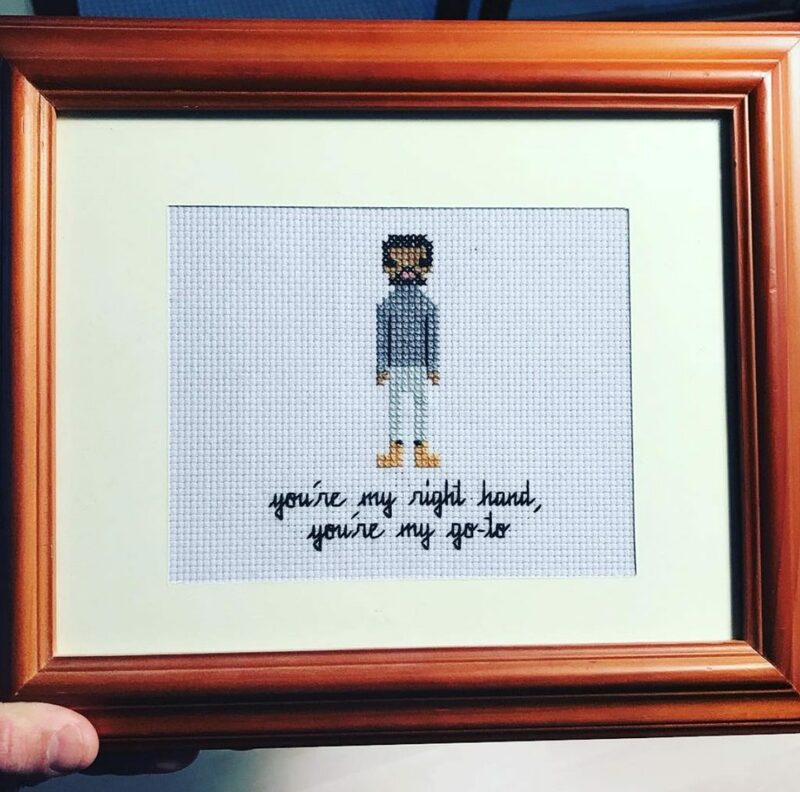 First up is our best buds Air Credits, comprised of Steve Sleeve from The Hood Internet on production and ShowYouSuck on vocals. These dudes just released a brand new EP last week and it is a serious heat rock. 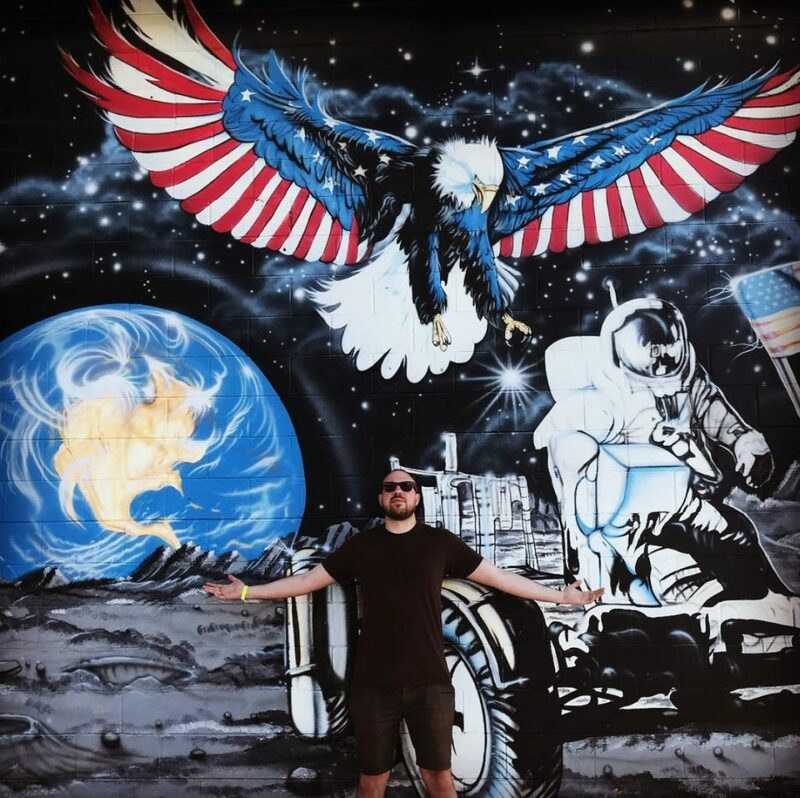 Check the whole thing out below and pay special attention to the last track, which features gang vocals from none other than Shredders and Astronautalis (picture below for proof). I just got a chance to check out the debut album from Soccer Mommy yesterday and I can confirm what everyone has been freaking out about: this record RULES SUPER HARD. I’m only two spins through but I have a feeling this is gonna be up there in album of the year talks no question. Here’s the first single below, but it’s definitely worth listening to the whole thing front to back. Loving it. My good friend Afrokeys just dropped an awesome new song with a super striking and cathartic visual accompaniment last week. Check out “Low” below. I got a lotta love for this song and this guy. I’m getting way amped for this crazy Rae Sremmurd triple album that’s coming out soon. I’ve got a serious soft spot for Swae Lee’s R&B songs, so his solo album is about as highly anticipated as it gets for me. This first “Hurt To Look” single only adds to that. Check it out below. It’s almost springtime, which means Khaled season is upon us once again. Here’s the first single off his next album featuring Jay, Future, and Beyonce. Not incredible but still pretty damn good. Anderson .Paak just released his first new solo music in what seems like forever. Digging it as always. Check out “Till It’s Over” below. Hopefully this means there’s a follow-up to Malibu on the way shortly. Sade dropped her first song in seven years! I gotta be honest, this one doesn’t do a whole lot for me, but any new Sade song is cause for celebration. Fingers crossed there’s more where this is coming from. Soldier of Love was definitely worth the wait seven years ago. Way pumped for a new Jon Hopkins album this Spring. Here’s first single “Emerald Rush.” I only got put onto this guy in the last year or so, so I’m extra excited to see what he’s been up to since the last one. The electronic Legend Gods Mouse on Mars are back with another teaser from their upcoming album Dimensional People. Here’s a chill segue track featuring Bon Iver. Really excited to hear the full project. BOOM! That it for jams this week. Now for an extra-special edition of Bonus Baby Pics. 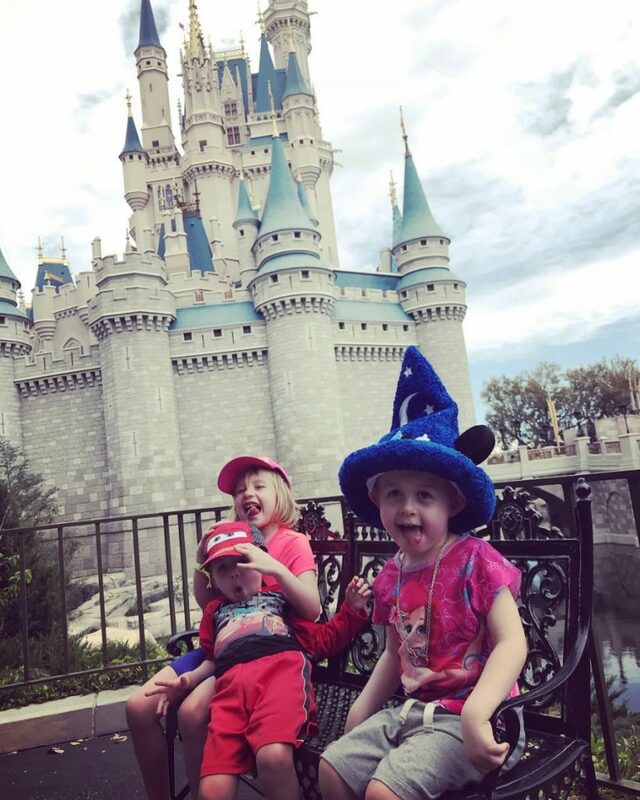 Like I mentioned up top, our little Party of Five took our first ever Disney World family vacation this past week and it was absolute mayhem in the best way possible. I feel like I just got run over by a Mac truck, but it was worth it. Here’s a recap of all the madness. 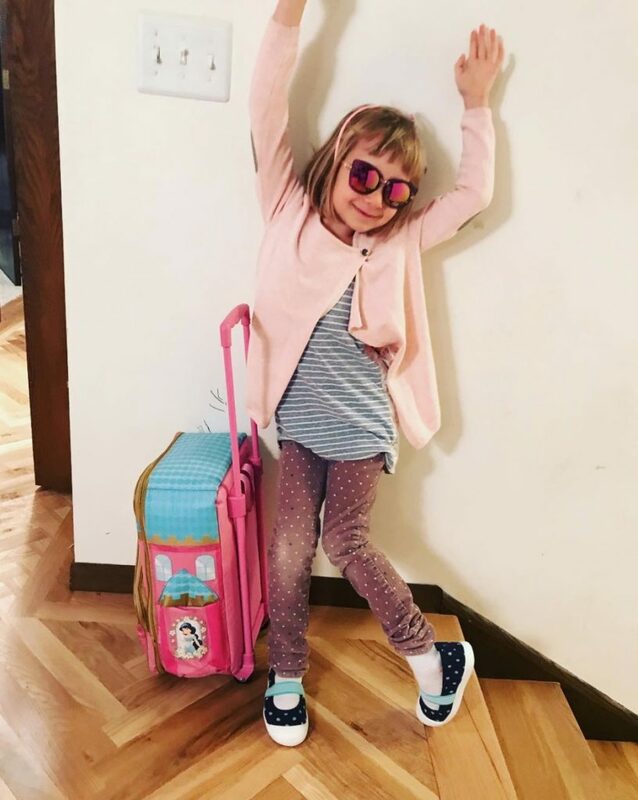 We got up at 5:00am last Wednesday morning and headed to the airport. Here’s Penny ready to rock. 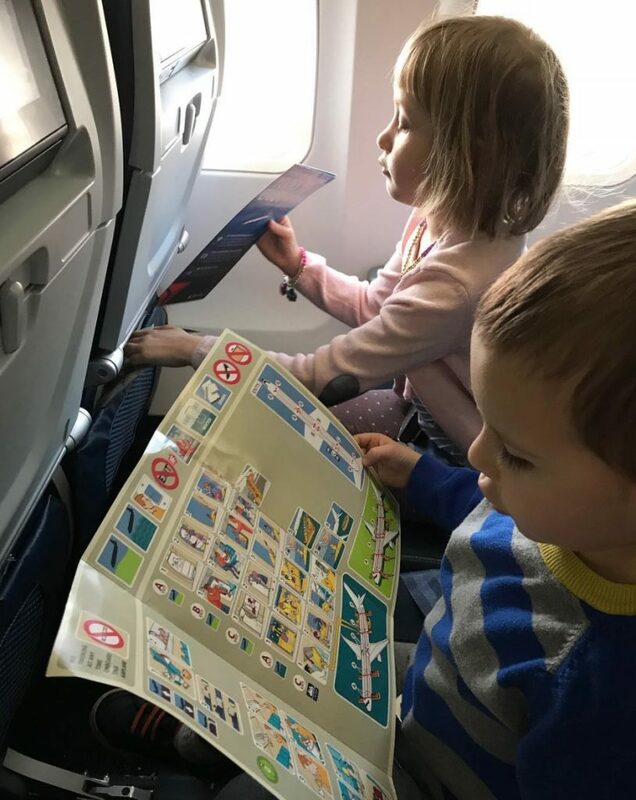 This was Lou and Cam’s first plane ride ever. They were total pros. Even read the instruction manuals and everything. 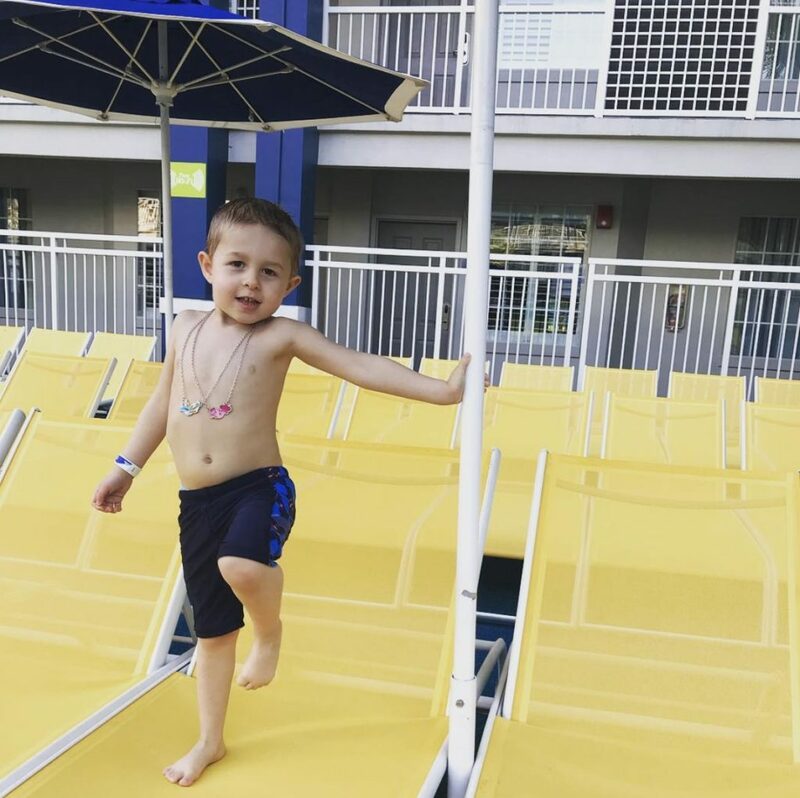 After a lot of planes, trains, shuttles, and automobiles we finally made it to the Holiday Inn Waterpark Resort right outside of Disney World. 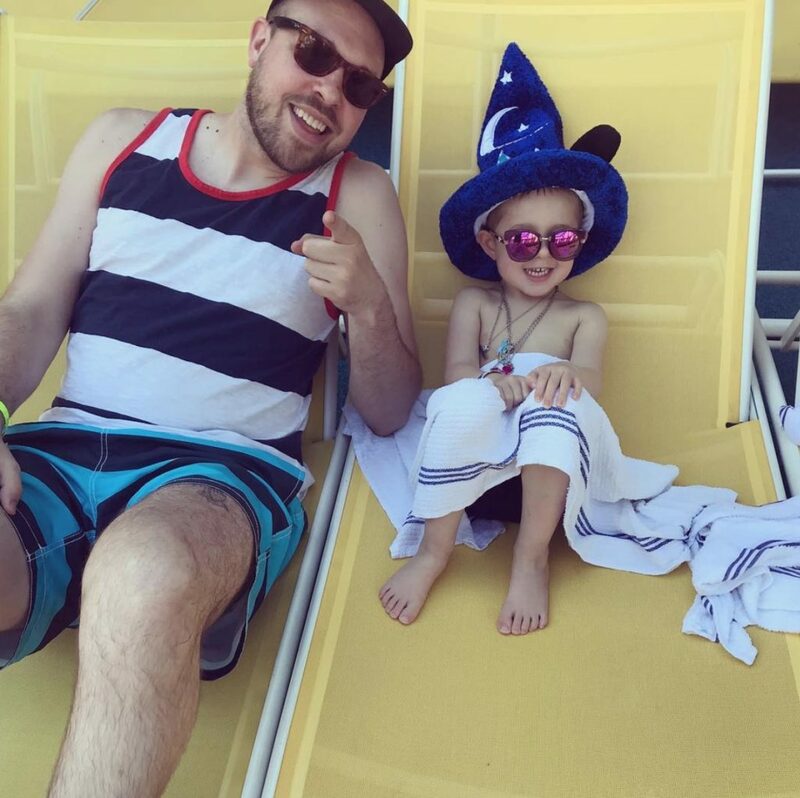 Here’s Lou donning his new 2 Chainz/My Little Pony look and celebrating by the pool. 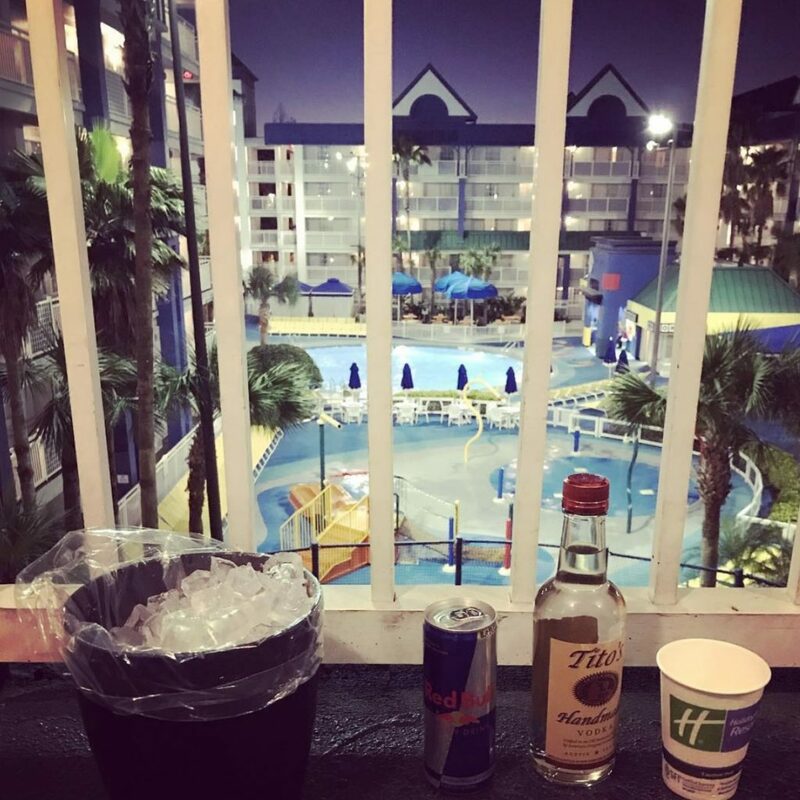 The next morning we got up bright and early for our first day at Disney World. These guys had no idea what was coming. 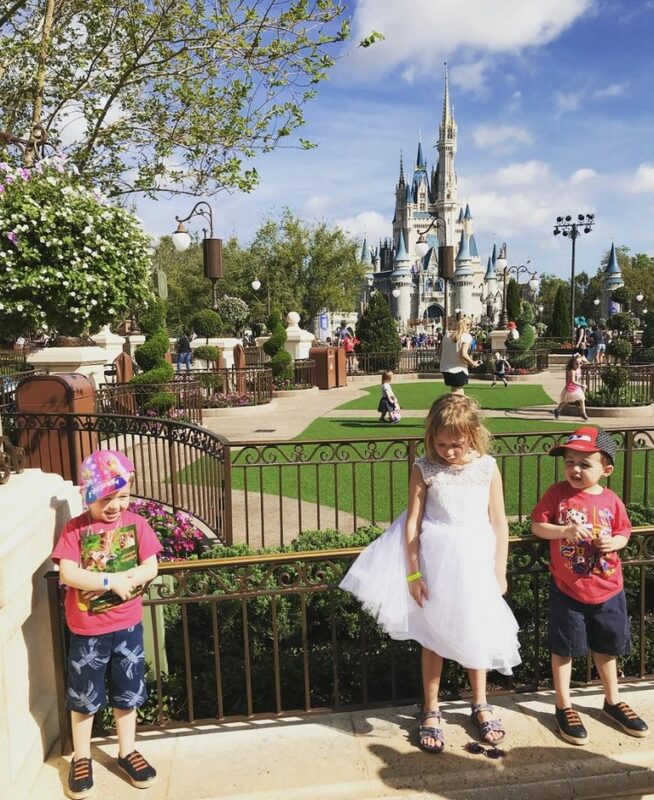 Everyone was incredibly star struck around the princesses. Cam hid behind my legs the entire time while Penny and Lou just made ridiculous faces and refused to look them in the eyes or say one word out loud. OMG the Under The Sea ride was INSANE!!! As was this crazy techno parade that happened in the middle of the day. 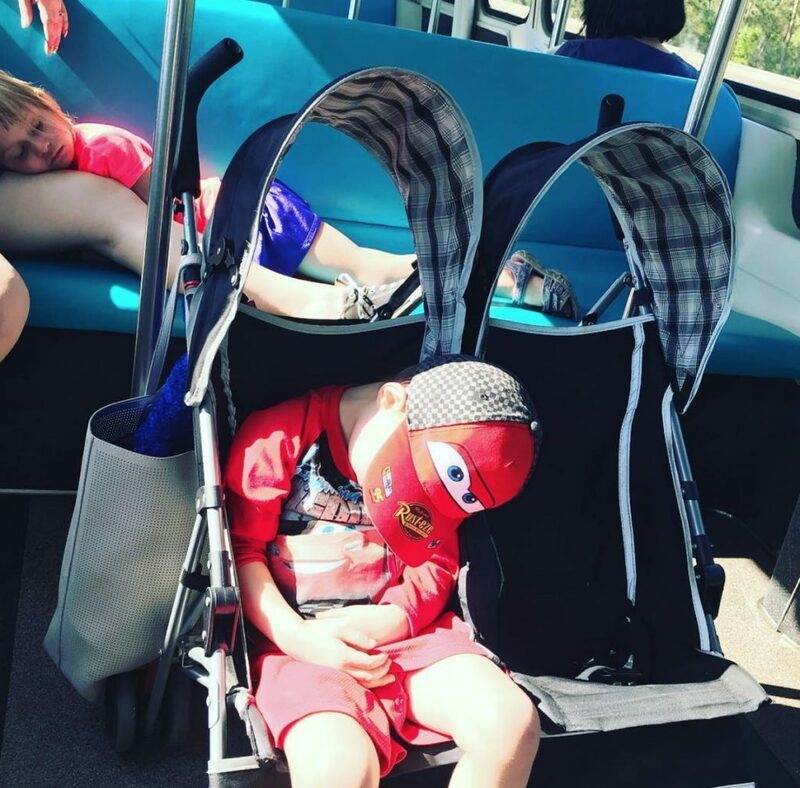 Disney World Day One was a serious doozy. 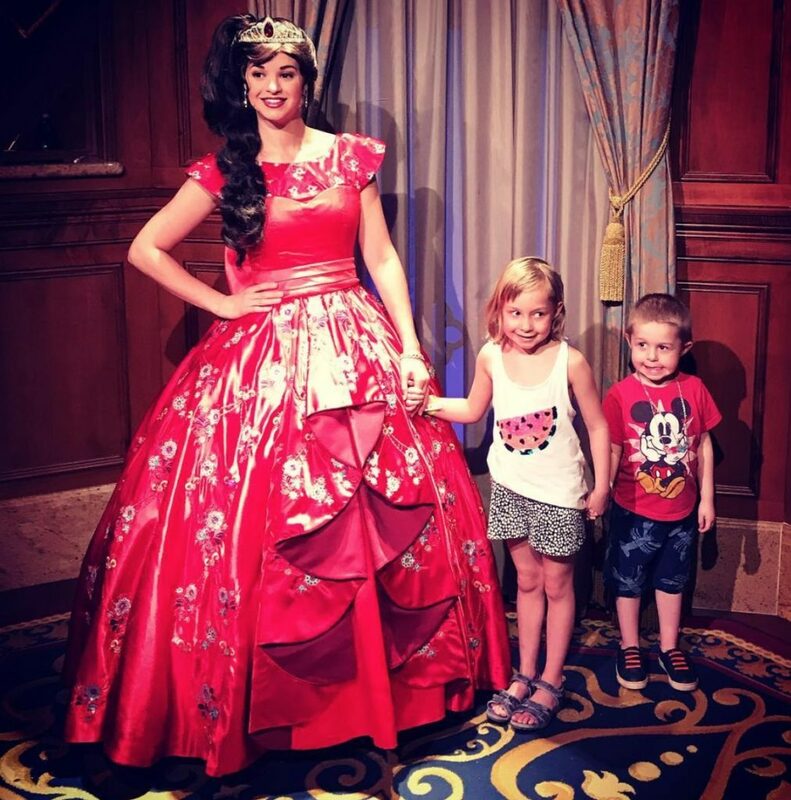 Jungle Book Cruise, Little Mermaid Ride, Water Fight, Speedway Race, Flying Dumbo Ride, Elena of Avalor Meet n Greet, Cinderella Meet n Greet, Festival of Fantasy Parade, and more ice creams than I’d care to admit. Zero casualties. Total success. The next day we chilled hard at the waterpark. 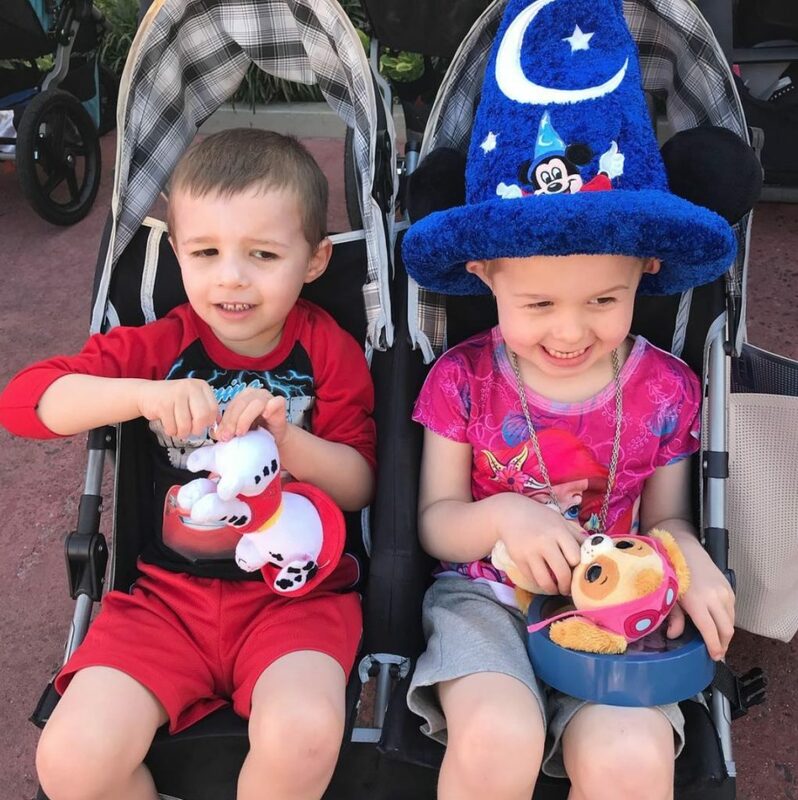 Here’s Magic Lou after picking up this Sorcerer’s Apprentice hat at Disney World the day before. It pretty much hasn’t left his head in the days since. This was also the debut of Florida Beak. Stripes on stripes on stripes. The boys got insanely good at playing bags. Our resort was so big it had three restaurants, a marketplace, a movie theatre, and a massive arcade all within its walls. Here we are in the commons area, doing some math homework. 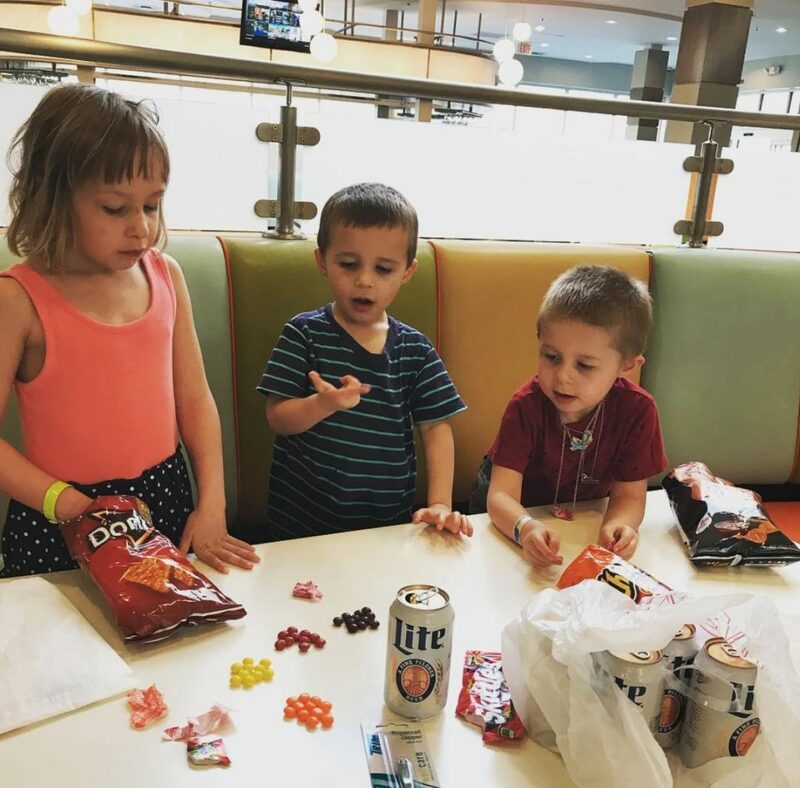 I created a new drinking game where every time the kids counted each pile of Skittles correctly I got to chug a Miller Lite. They also got to eat a Skittle so it worked out great for everyone. Huge shouts to my friend Penijean for making the drive from Tampa and hanging with our fam that night. She was able to document what it looks like pretty much any time we try to go out for dinner in public. I Shazam every single pop song that comes on over the speakers while Penny, Lou, and Cam dance like idiots until we’re eventually asked to leave by the manager on duty. Case in point….. 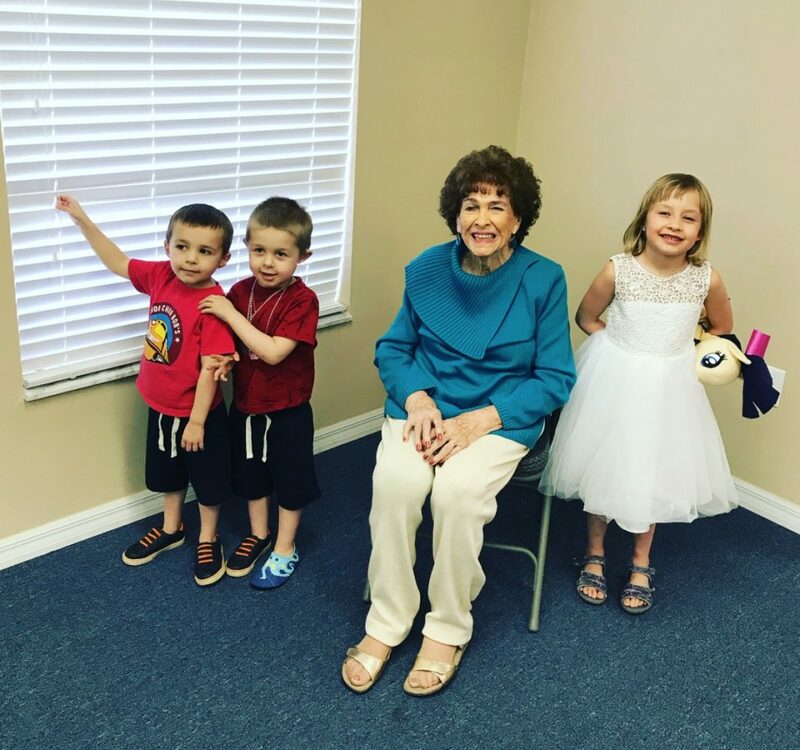 The following day we picked up our rental car and headed to Titusville to visit the kids’ great grandma GiGi. 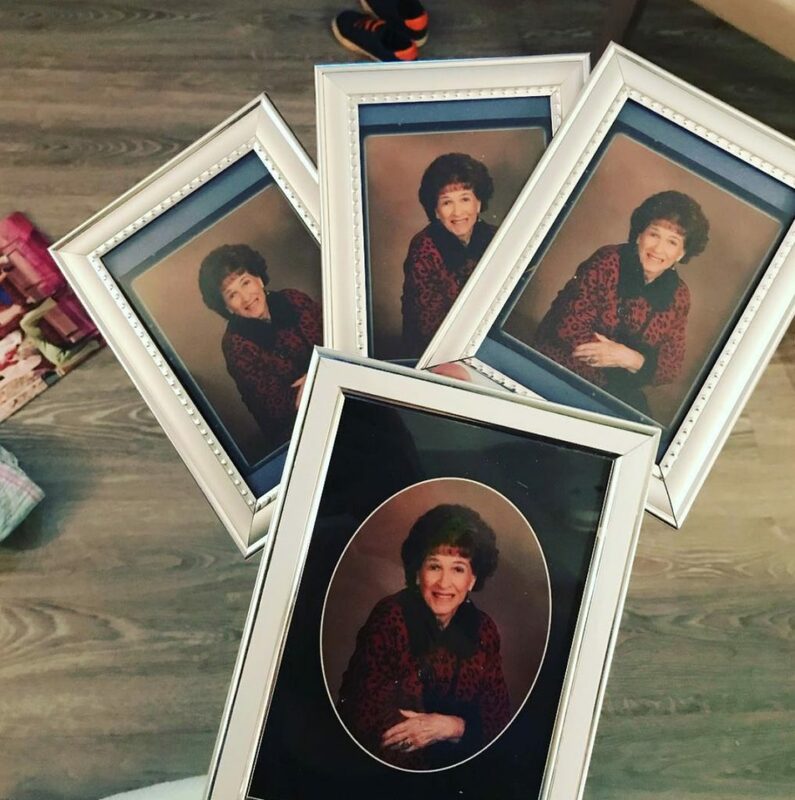 GiGi is in her mid-90s and still getting dolled up to the 9s. 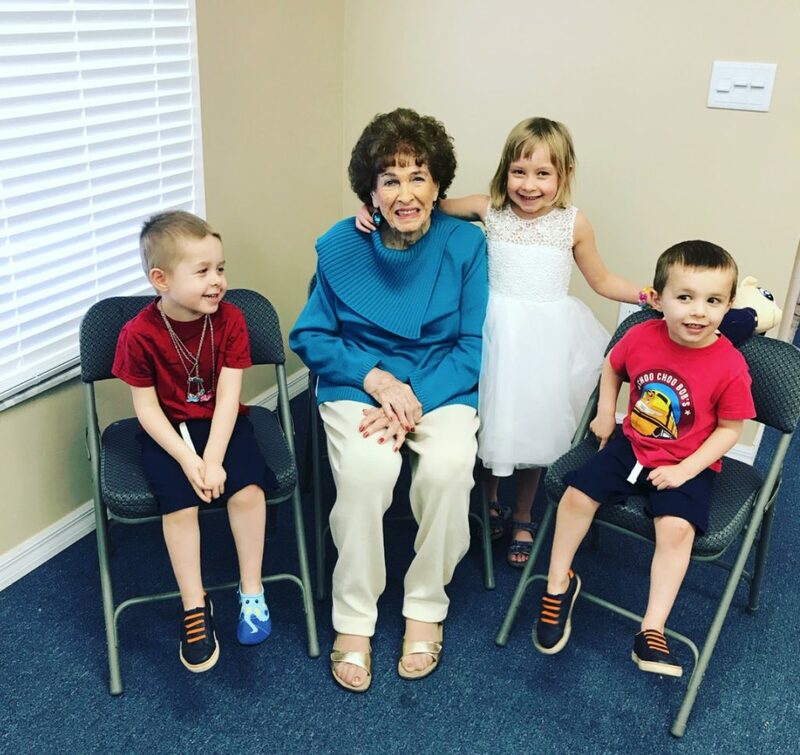 It was her first time face-to-face with Lou and Cam and we all had an awesome time. After lunch we made our way further East to Cocoa Beach and the kids all got to play in the ocean for the first time. So tight. 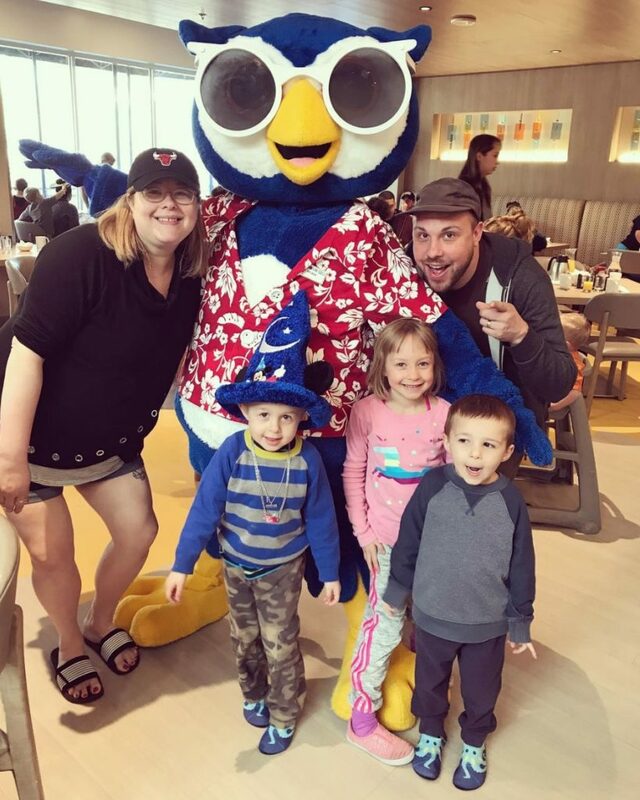 The next morning we got to meet this weird Owl character at breakfast. No idea what his deal is, but the kids loved him so it didn’t really matter. Owl Man meets Towel Man. 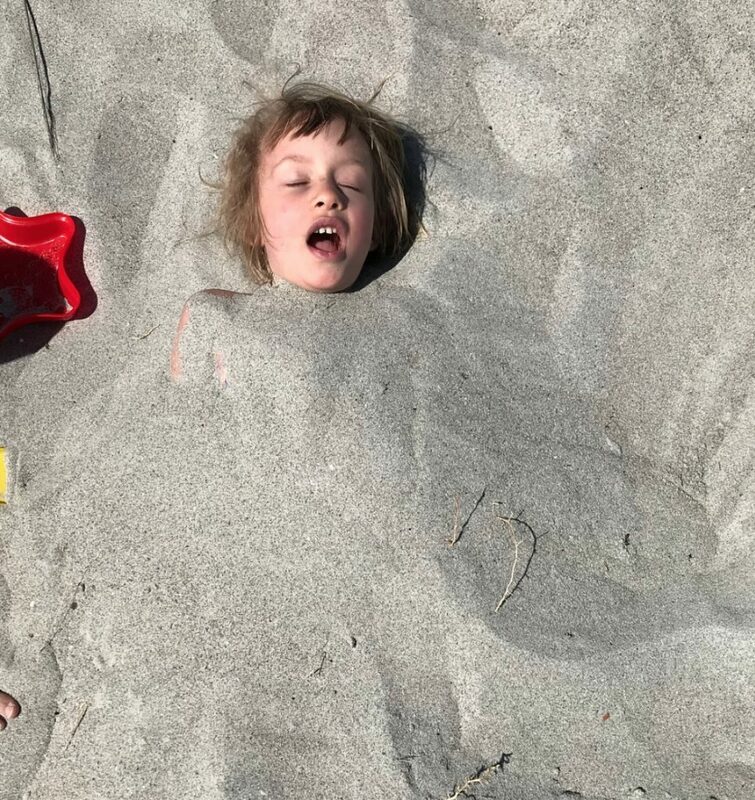 Decided to head back to the beach since we still had the rental, and I made up yet another drinking game: Convince the kids to bury each other in the sand until none of them are able to move, then go to the bar for margaritas. That night after the kids went to bed I quietly treated myself to the spoils of victory out in the hallway. 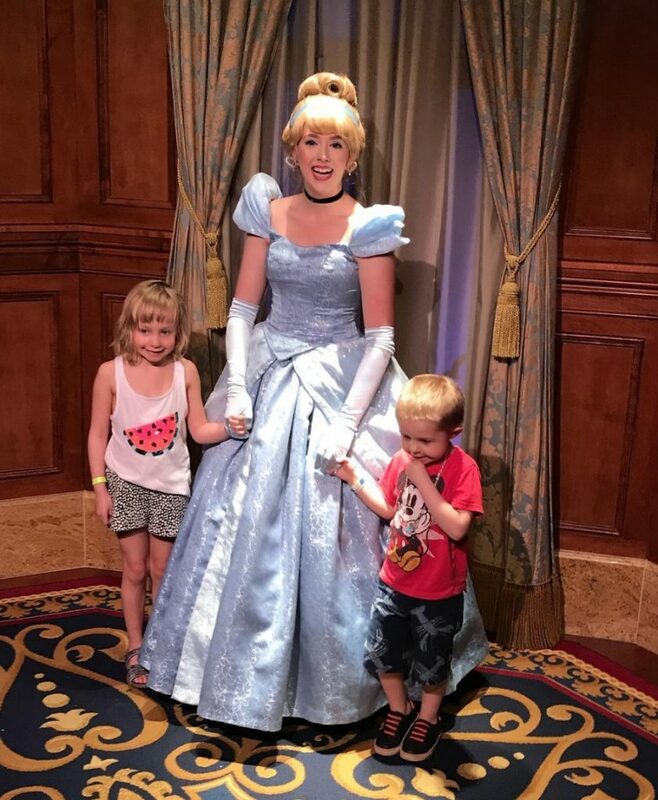 For our last day of vacation we decided to brave the Magic Kingdom one last time. Here’s Cam and Lou raring to go. Shouts to the discount Disney knockoff store across the street from our hotel for clothing us all at a fraction of the price of the real thing. 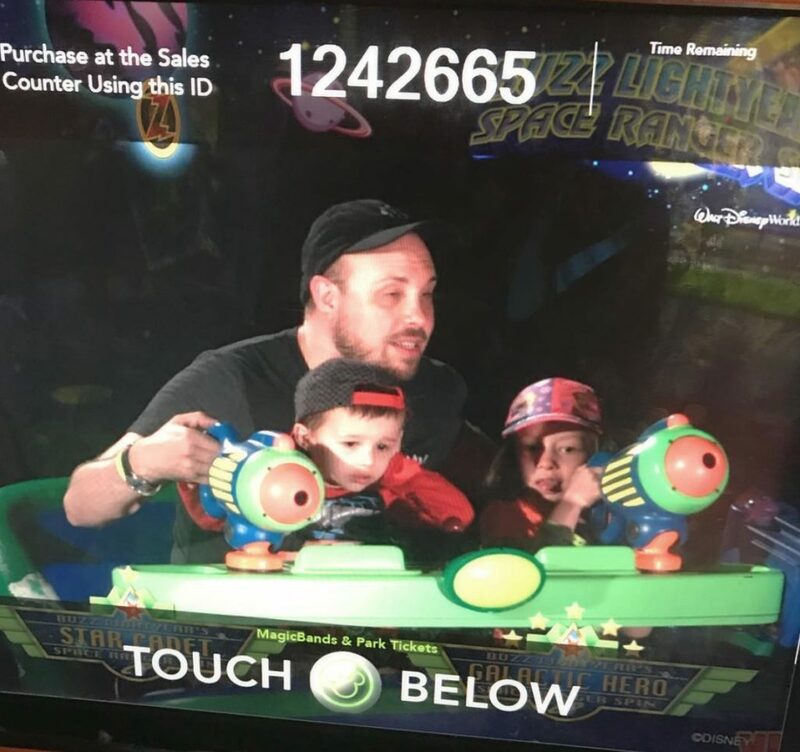 Pretty cool picture of us on the Buzz Lightyear Space Invaders ride. The greatest thing ever happened when we went to the Enchanted Tales With Belle area of the park. Penny got to play Maurice and Lou got to play Beast in a crazy interactive theatrical performance. Here’s Lou getting to dance with Belle at the very end. Dreams come true, anything is possible! 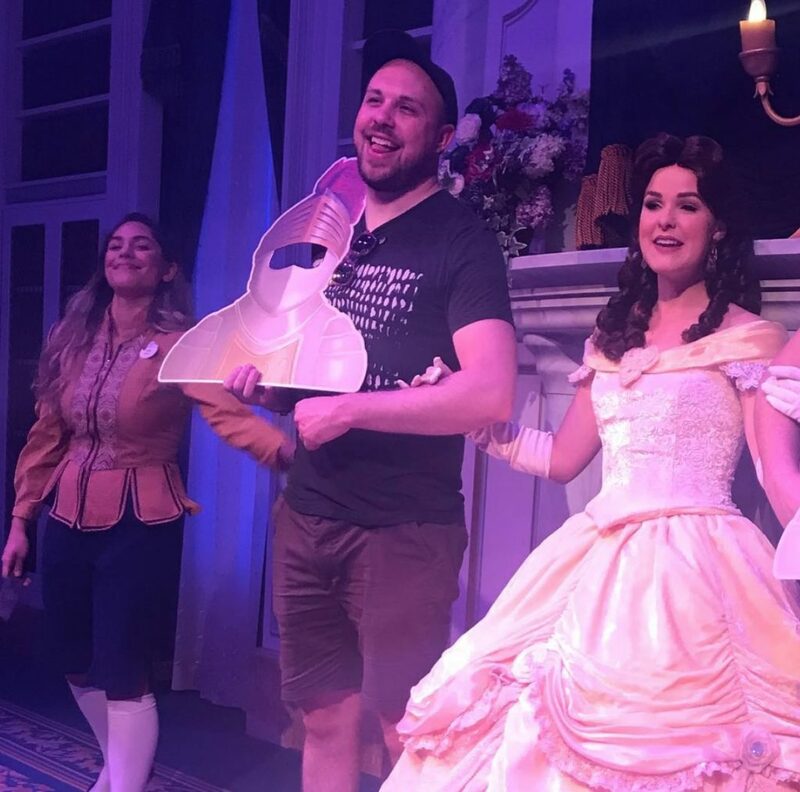 And in a weird twist of fate, I was chosen to play the knight of the castle and protect Belle from Gaston and his henchmen, which in my kids’ eyes is easily the coolest thing I’ve ever done. Gotta admit, I did nail the march. Aaaaaaaaaaaand success!!! Day Two involved Enchanted Tales with Belle, Buzz Lightyear Ride, Dance Party Parade, Thunder Mountain, Mad Hatter Tea Cups, It’s A Small World, and Mickey’s Philharmagic. Good lord almighty. And just like that it was all over. We got up at 5:00am the next morning to head to the Orlando airport. 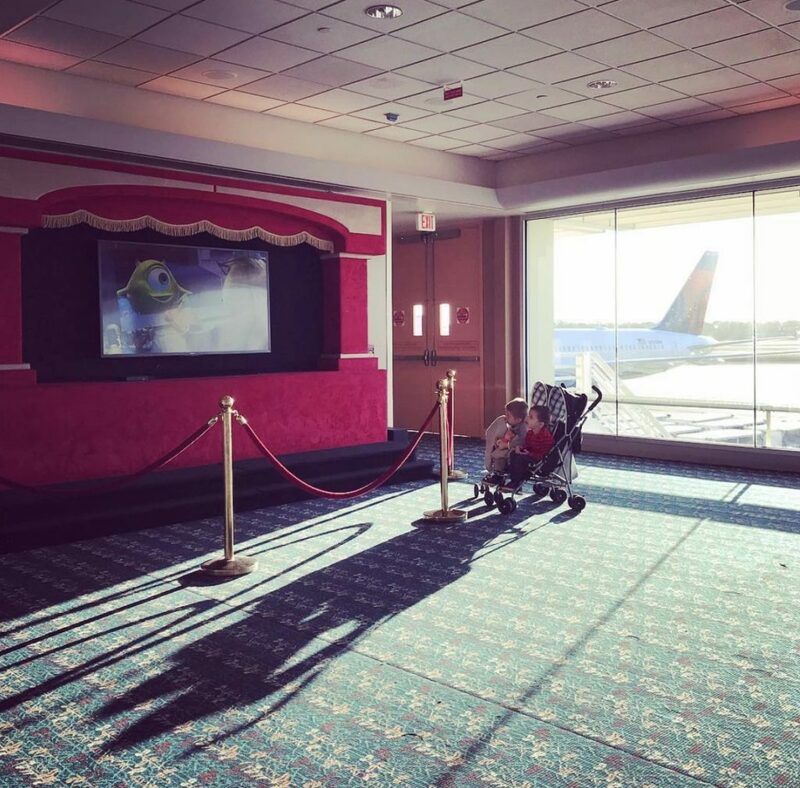 Enormous shouts to the Delta terminal which happened to be playing Monsters Inc at 7:00am. God bless you. 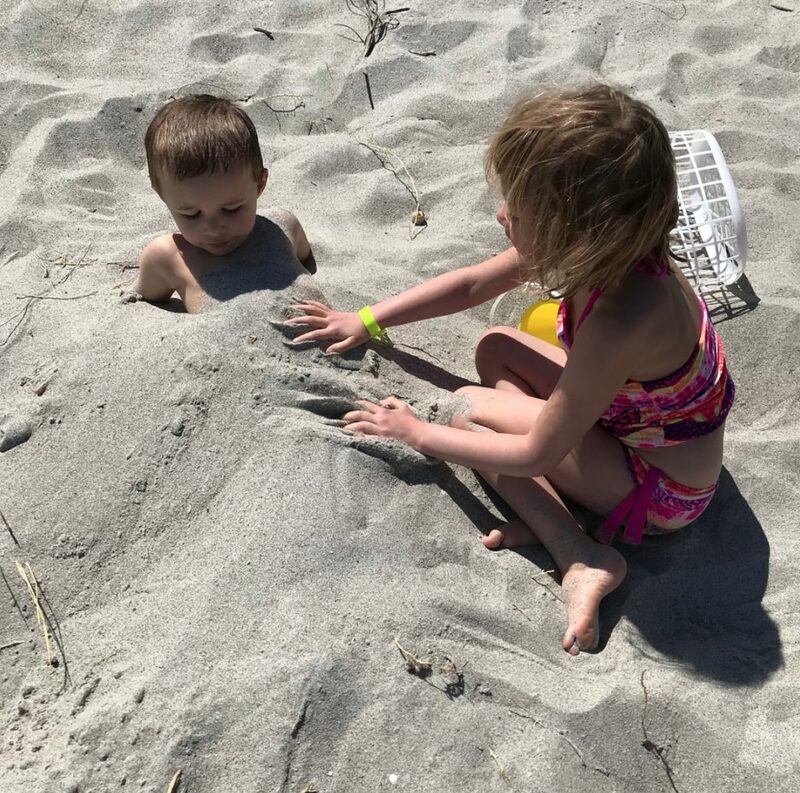 Oh and I can’t thank the wifepiece Killa Cam enough for being the ultimate partner-in-crime and wrangling these little idiots like a total badass. Here’s a pic of her belated b-day present that I got made from the incredible ladies at 3DRD Crafts. The best. BINGO BANGO! That does it for this super long post. I hope you all have an absolutely wonderful week. 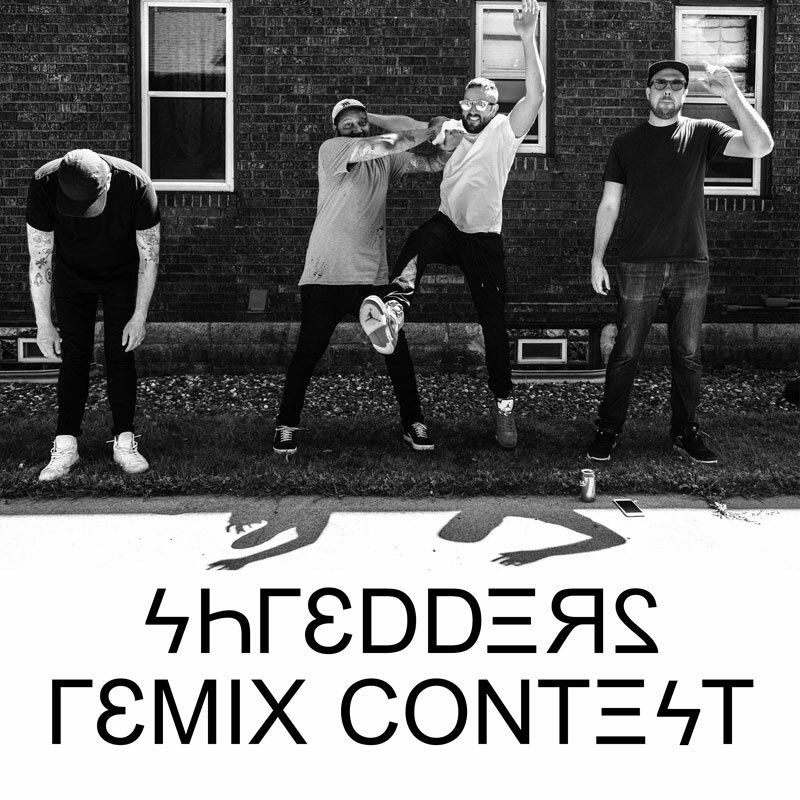 Go vote in that Shredders Remix Contest right HERE and I’ll see you back here on Tuesday to reveal the Top 10 finalists.